ey guys. Christmas will soon be knocking on our doors. And I absolutely love Christmas, it’s the best holiday because it is all about being together and sharing the love and happiness with your closest people. What a better time to take a break and go around with your camera in between the meals of course to capture the moment and the festive atmosphere of the celebrations? This year I am going to do it with a new piece of gear. It is the Canon 650d. The camera is the Canon 600d’s successor but is still addressed to beginner photographers and enthusiasts. What is more it beats the 600d with much more than a touch screen LCD. Indeed, it is a pretty good camera body that along with the many automatic shooting modes and handy controls, excels with great technical characteristics and captures great high-quality images. 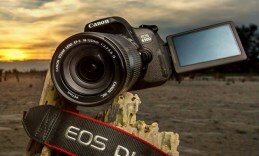 At the same time the 650d camera body offers a variety of functions to keep the interest and help you discover and practice new techniques. In other words it becomes a powerful tool in the hands of experienced photographers. The overall body design features stainless steel and polycarbonate combined with glass fibre. 650d’s ergonomic design and the textured grip provides stability and good control when taking pictures. The coolest design feature is the 3’’vari-angle TFT Liquid Crystal LCD screen that flips and rotates in the most flexible ways, you have 270 degrees of freedom so that you can assume a comfortable shooting position and then adjust the screen to the most comfortable angle regardless of your position. For example when I take macro shots of flowers or bugs it is much easier to turn on the LiveView mode and rotate the screen upwards in stead of lying on the ground in order to watch through the view finder. Experimenting with different angles is simple as that. The movies this EOS body captures are high-quality ones in FULL HD at 25fps, 24fps you can also choose at the frame rate of 50fps using high-speed AF. The camera continued to surprise us pleasantly we were pleased to find out that the flexible vari-angle screen is also a capacitive touch-sensitive one. It provides controls of the shutter speed, exposure and ISO sensitivity at the tip of your finger. During the shooting process you can also touch-snap the pictures. The maximum shutter speed of 1/4000 allows you to nail fast-moving subjects. You are facilitated by the 5 frames per second this camera body provides. Now let’s take a look inside the compact body of canon 650d. It produces 5184×3456 pixel images. The image sensor is of CMOS type and provides 18 effective megapixels. Its performance is supported by an EOS integrated cleaning system. The image processor type on board is DIGIC 5. The lens is EF/EF-S mount. We tested the camera with the new EF-S 18-135mm f/3.5-5.6 IS STM lens. Focusing is one of the most important technical aspects of the camera testing. The 650d has 9 cross-type AF points. The ISO sensitivity extends up to 12 800 and only small amount of noise is noticeable on the image. There is a Multi Shot Noise Reduction setting that improves low-light images that are taken at high ISO speed. It reduces Chroma noise and cleans out even the smallest details. The body offers quite a few white balance modes: Auto, Daylight, Shade, Flash, custom as well as white balance compensation so that you can shoot in any environment, under any kind of light. Here we must also add the bracketing function that easily creates your HDR images with just a single push. Personally I love it because you don’t even need a tripod to use this impressive technique. The built-in flash on this body is a pleasant surprise. It provides great and even lighting at short distances and does a perfect job to snap a portrait picture of your family and friends. There are 14 different shooting modes including Intelligent Auto, which will make the most out of this camera’s hardware as it automatically analyses the shooting scene based on the environmental conditions like brightness movement and contrast as that you guys receive the best results possible. The storage type on this camera is of SD, SDHC, SDXC and UHS-I type. The external interface also includes Hi-Speed USB/HDMI port as well as Stereo OUT and remote control terminal. The weight of the body including the battery is 575g. The Li-ion battery provides long work life when taking pictures but in LiveView mode it dies fast.